1. Validate the species' names in the .tfm4 matrix using the"Thesaurus wizard" web service in T4. NOTE: This step is of instrumental importance for data-basing the matrix in Demiurge without errors in the attribution of the species it refers to. Although T4 can be used for data analysis without validated species' names, validation is compulsory prior to initiating the edition of a genetic diversity digest for publication in the Demiurge web server. If at least one name is not validated, the transfer will not proceed, and the corresponding digest author will be requested to use the Thesarus wizard to validate the affected species names. 2. 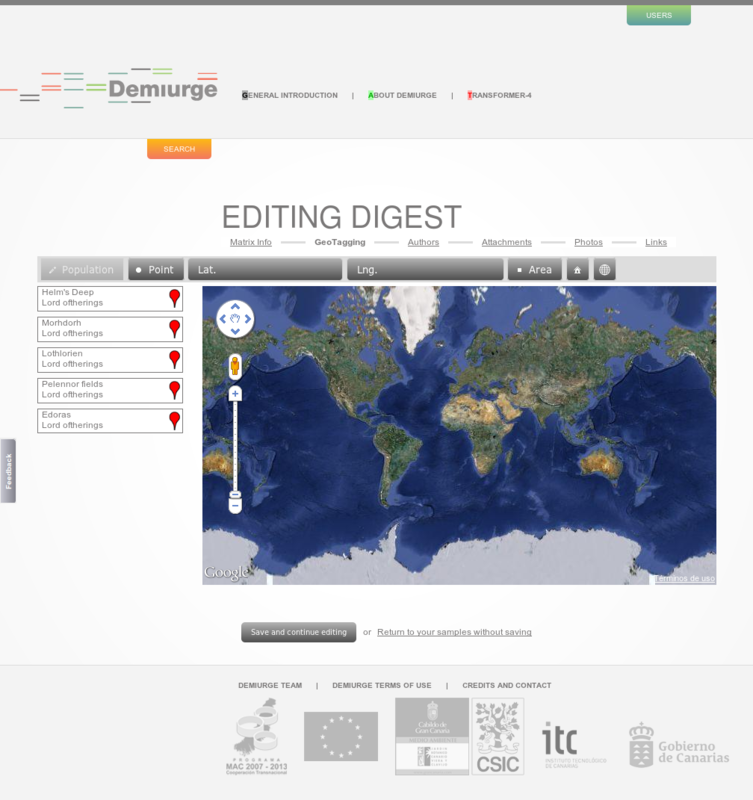 Open the Demiurge digest editor from T4. 3. Log in Demiurge with a valid email and password. 4. Geo-reference the populations that appear in the matrix, via the simple protocol implemented in the Demiurge digest editor. 5. Fill in at least the other mandatory fields in the pages of the digest editor. 6. Attach any optional information items. 7. 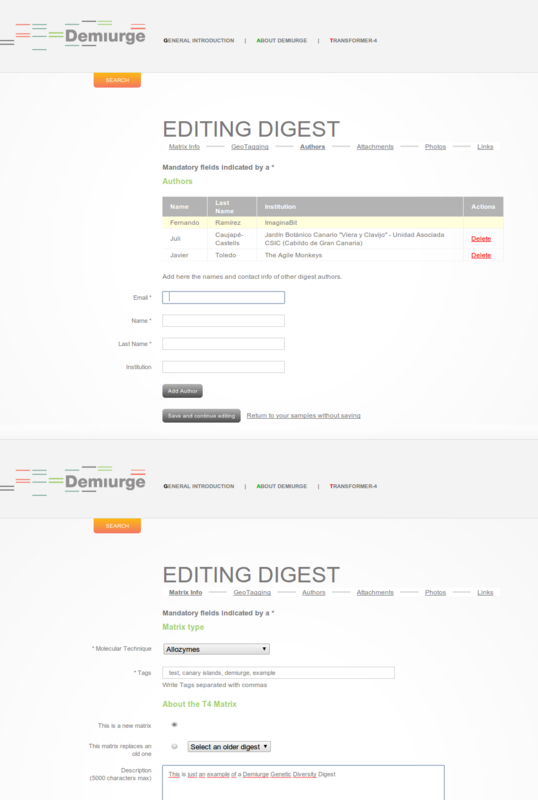 Submit the digest by clicking on the green "Save and send for review" button in the last page of Demiurge's digest editor. This is a very fast and easy process. Most of the fields in the digest editor are automatically filled in by Demiurge upon submitting the matrix in T4 format, and the names of the populations to geo-reference are also taken by Demiurge from the T4 file, so that authors only have to position each population in the geo-referencer. 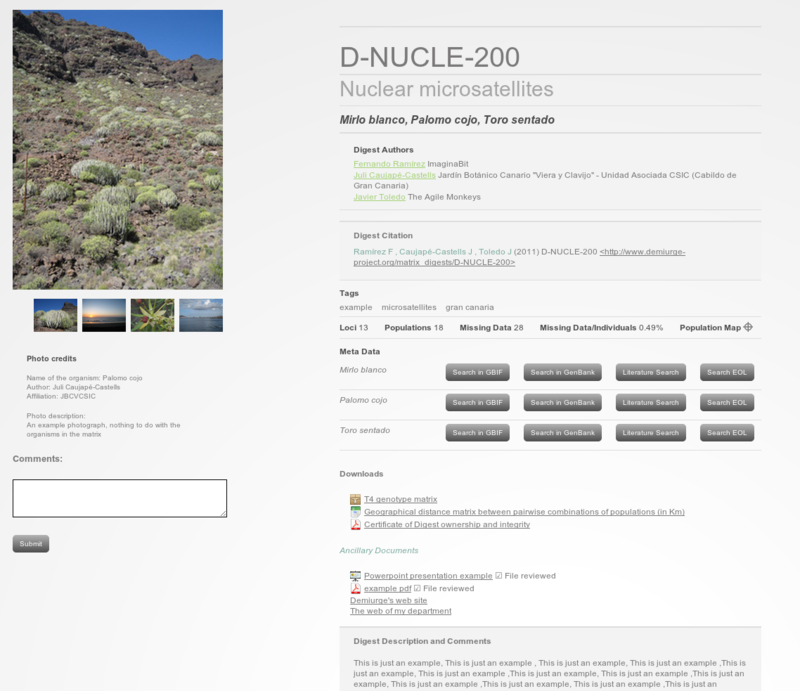 The digest is then associated with an URL, and the species included in the T4 matrix are automatically linked to available meta-data about them in GBIF, Genbank, Jstor, and the Encyclopedia of Life. If you decide to stop the process of digest submission, the digest editor will save the changes, and your unsubmitted digest will be available in your next Demiurge session clicking on the "Digest" tab of your user menu. Multiple incomplete digests can be stored in this private part of Demiurge. Upon successful completion of a short digest review process, Demiurge emails all the digest authors an e-certificate of “digest authorship and integrity”, and the reviewers receive an e-certificate acknowledging their scientific collaboration. Subsequently, the digest is published and becomes searchable within Demiurge. After publication on the web, digests can be managed by their corresponding authors, as their unique Demiurge registration code will allow them to modify any of their text elements (except the genotype matrix), and to add or remove ancillary information.